Windows Active Directory Bulk User Modification - Reset passwords, Unlock Users, Move Users, etc. - using ADManager Plus. Managing the user accounts in Microsoft Active Directory is an arduous challenge that every IT administrator faces every day. Manually configuring and modifying the user properties using the native tools, PowerShell scripts, etc. is extremely time consuming, tiresome, and error prone, particularly in a large, complex windows network. Moreover, it requires an in-depth knowledge about the Active Directory to accomplish these tasks. In such scenarios, administrators find it extremely taxing to free themselves from simple, frequently occurring tasks like reset passwords, unlock account, etc. to focus on the more crucial and mission critical tasks. ADManager Plus is a web-based Active Directory Management and Reporting software that allows mass modification of user attributes, including the Exchange, Remote user logon, Terminal Services and Lync Server/LCS/OCS attributes. 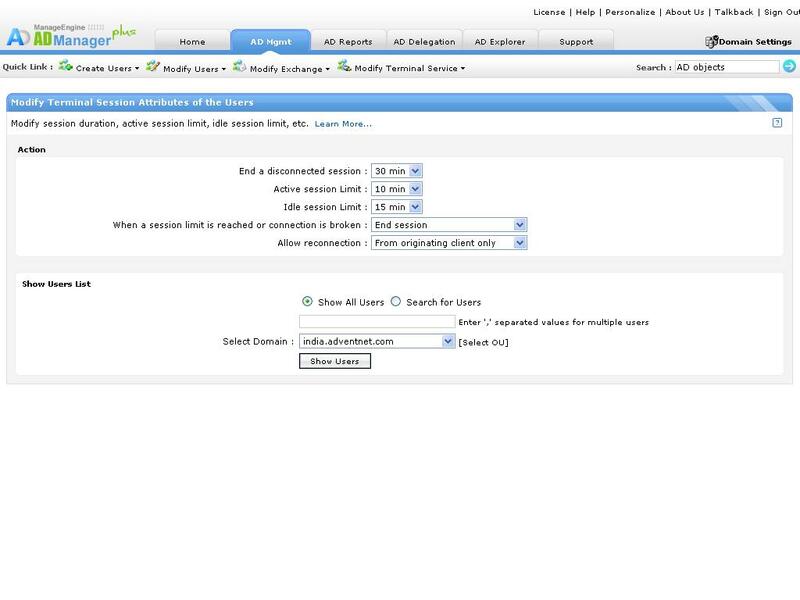 Common modifications, such as resetting passwords for multiple accounts, changing the display name, creating mailboxes in Exchange, enable/disable/delete inactive accounts, moving users between OU's, and other Active Directory management function can be done quickly and consistently, for any specific container(s) like an OU or domain from a single console by the administrators or the help desk technicians to whom the role has been delegated. Using this Active Directory tool's reactive user account management feature, you can even automatically update certain attributes of user accounts based on the changes that are being made to the user accounts. You can explore all the user modification features of this software using the free trial download that provides unlimited access to all Active Directory user management, modification and also reporting features. Create Exchange Server Mailbox for users and enable their Archive mailboxes. Set the Recipient Limits and Forwarding Addresses for users. Modify Exchange Server (2010/2013) policies. Get the free download of ADManager Plus's trial version to explore all its user management features in detail. 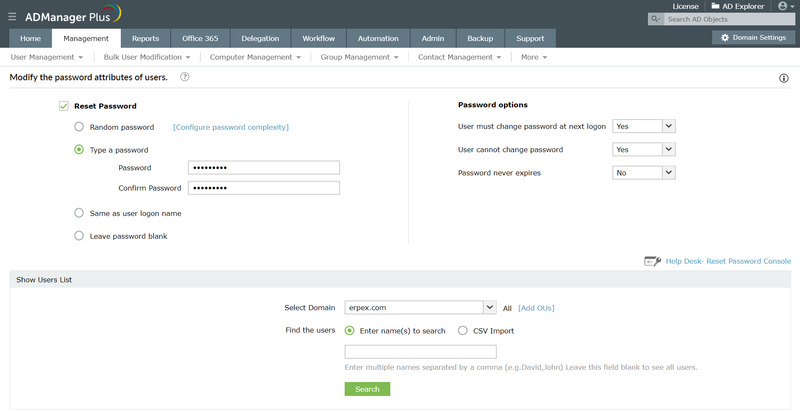 ADManager Plus allows administrator to set password options at one instant avoiding numerous steps involved in native Active Directory. Reset user passwords from mobile devices. Learn more. ADManager Plus with its simplified, completely GUI based and an exhaustive set of Active Directory management and reporting features is an easy and efficient alternative to the complex and tedious native Active Directory tools and PowerShell scripts.